Helen’s Intensive Pilates Studios have been dominating the fitness savvy community for more than a decade. The studios provide private, semi-private and group sessions. Helen’s Pilates offers a wide selection of innovative and traditional classes. The Pilates Apparatus classes include: Reformer, Tower of Power, Wall Tower, Springboard, Cadillac, Pilates Chair, Pilates on the Edge and Cardio Pilates Jumpboard. You will also discover a new generation of cutting edge Equipment Programs such as CoreAlign® and MOTR®. For the optimum exercise variations you may take advantage of the foam rollers, Pilates rings, resistance bands, weighted balls and kettle bells. Helen’s clients may also enjoy a variety of Non-Apparatus classes such as: Barre Pilates, FitBall, CardioWeight, Pilates Roller, KettleBell Fusion, Yogatoning, Yin/Restorative Yoga, Zumba and Piloxing. Helen Ovsiy is the Founder, Master Instructor and Educator of Helen’s Intensive Pilates and Fitness Studios. What interested Helen in Joseph Pilates’ Method of exercise was the intense focusing on the body in totality. The Pilates Modus encompassed the physical, the emotional, and the spiritual self! Helen has had the privilege to travel worldwide which has afforded Helen the experience and certification in the areas of Vinyasa, Ashtanga, Yin Restorative Yoga, Reiki, Thai massage and Ayurveda life knowledge. 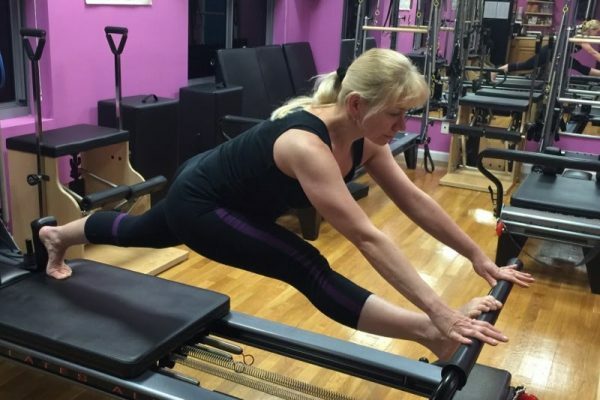 The culmination of all of Helen’s experiences has enabled and motivated her to grow to the highest level of understanding the critical depths of Pilates philosophy. Helen had the longing to share and teach others the new and innovative methods of exercise techniques and rehabilitation. Her understanding of the human body has become a gold mine of practical and educational wisdom for her students and clients.